31st December 2012. 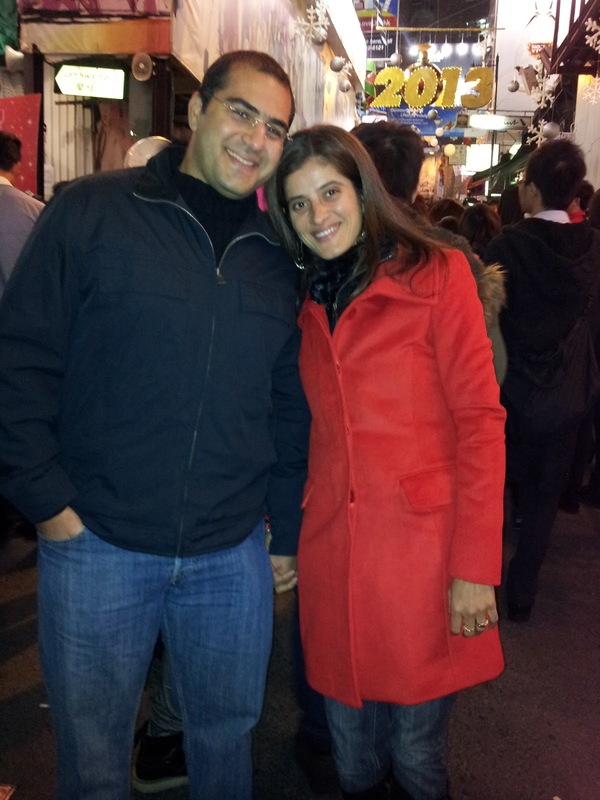 Our first New Year’s eve in Hong Kong. I was quite determined to get out and do something. Booked the baby sitter in November for the boys and informed my husband that we ARE going to be out that night. He did not say a no but was not very happy about it either, saying “Ok, let’s see,” which in his parlance means I don’t think I want to go. Well that did dampen my spirits but I had not lost the battle yet. Somehow we have always spent New Year’s eve in the company of family and friends. Last year we had given a pre-Navjote terrace party in Mumbai, the year before we were all charged up to get the night rocking in London, but the warm, cosy house, the Christmas pudding and the mulled wine at our aunt’s kept us firmly indoors and away from the freezing temperature of England’s winter. So this year I had made up my mind that I wanted to celebrate New Year’s eve the way we used to all those years ago. I did check with a couple of friends about their plans but everyone seemed to have nothing specific planned so it only seemed natural when the two of us ventured out by ourselves, leaving the boys with our very caring sitter who arrived at half past nine. Any later and both of us would have bundled ourselves up on the couch enjoying a late night movie with popcorn! We headed to the bus stop to take a bus, no point in wasting money on a cab specially since we were in no hurry! We happened to take the bus with the longest route and sat quietly, holding hands, content in each other’s company, with an occasional glance at the cell phone to check for new messages or facebook updates. I guess 11 years of marriage plus 5 years of courtship gives one a feeling of quiet contentment when a comfortable silence more than words fill the air. This is also the first late night out when I felt that my kids have grown up, when there were no emotional anxieties at the door or no frantic messages to the sitter to find out if they were still pouting, or playing or in bed. In fact last night was the first time I did not call or text my helper at all! We landed in the Central district and started walking towards Lan Kwai Fong which is where Hong Kong’s night life resides. I was taken aback by the special security forces called in, the policemen, the complete re-oranisation of the whole place which had been converted into a one-way street leading out into the not so crowded areas. What was more, amongst the massive crowd that was already accumulating, not one person thought about going off the given route or jumping barricades! Everything was so systematic, there were even first-aid corners and ambulances in place for unforseen accidents. 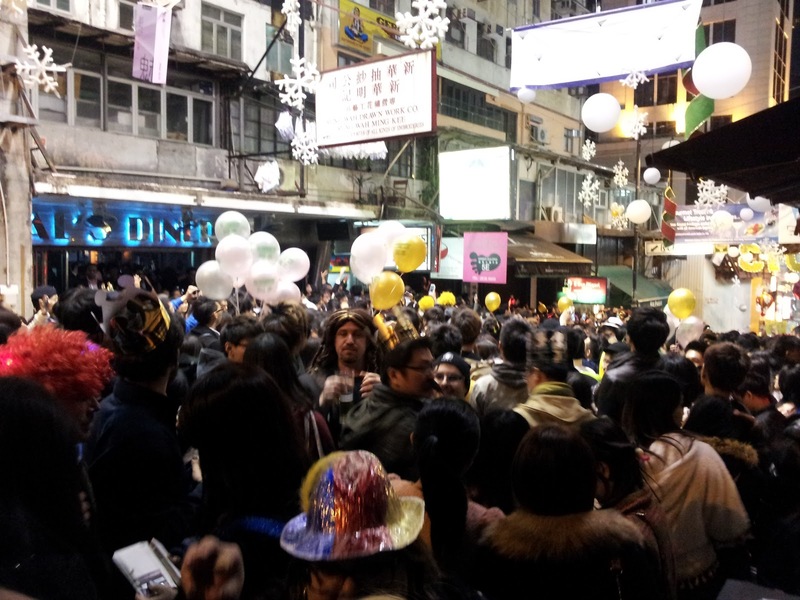 In the midst of all hoopla we managed to follow the directed path and reached Lan Kwai Fong or LKF as it is more popularly known. The place was buzzing and it was only 10:30pm. As we walked through the crowd we were amazed at the spirit of the people who were in their full elements, celebrating, cheering, some like us just staring and wondering about the mix and match of nationalities, cultures, languages and colours. Yet everyone was there to celebrate just one event – the change of the year! Having no plan whatsoever we just took up a nice corner table at a pub called Stormies and ordered our drinks. It turned out to be an excellent choice made (by my husband) as not only was my pinacolada heavenly but the music being played was very enjoyable too. It was retro 80’s music bringing back a flood of memories for both of us. One drink down, while chatting over the blaring music, shaking our shoulders and tapping our feet to the catchy beats, there was a sudden further rise in the decibel levels as more speakers were put in action, the lights further dimmed and the place getting more crowded than ever. I wanted to watch the traditional midnight fireworks at the harbourside and started nudging my husband that we should be leaving soon. We were planning on going to my husband’s office which happened to be in a skyscraper building overlooking the harbour and which could give us an excellent view of the fireworks. But by now he was slightly hesitant on leaving this nice rocking pub to go and stand in a ‘dark room’ as he put it, with just the two of us all by ourselves, just to see a couple of fireworks in the sky — a prospect that he would have grabbed a few or exactly 11 years ago! Anyway, husband won, and we stayed put. In fact when we stepped outside we were astounded to see that the moving crowd had suddenly stopped moving and everyone had just gathered together, waiting, watching for something to happen. We craned our necks and stood on our tippy toes to try and find out if something was happening or going to happen at the stroke of midnight. But besides a very excited crowd, lots of colourful banners, lazer lights, flash torches and blaring music, everything seemed perfectly in place! 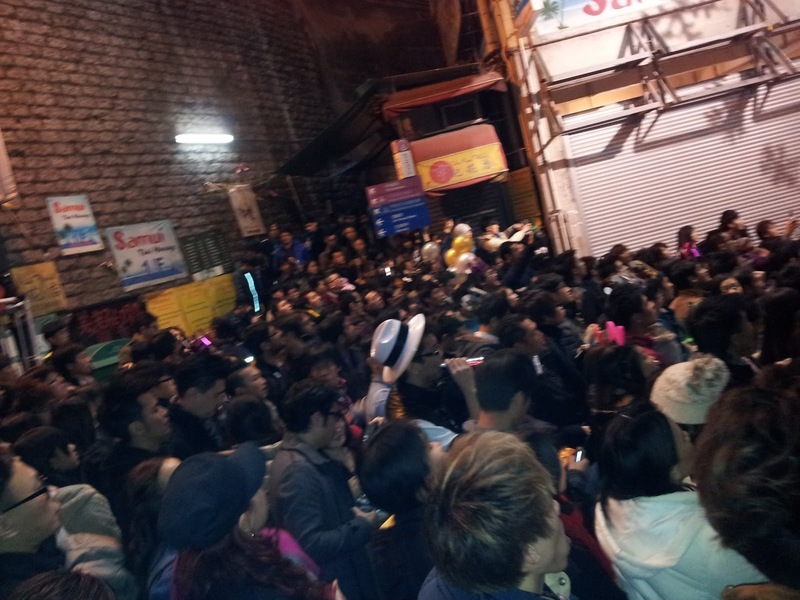 It was 11:45 by now and we could feel the exhilaration building, rising, reaching a crescendo with the “Gangam style” music. After that there was no looking back, we took a quick look at our watches and at each other waiting for the final countdown….10…9…8..7..6…5..4..3..2..1……..HAPPY NEW YEAR….2013 was welcomed with a hugs, kisses and a blast!! Barely five minutes later the crowd started moving and again in a very orderly fashion. One thing that struck me is that even though I was in the midst of a strange cosmopolitan crowd, not once did I get the feeling of anyone staring at me. I was not worried about purposeful elbows or hands being shoved into my back or front or about my camera or wallet being picked. Yes there were a couple of inebriated men and women but who were lost in their own world and who the police were very sportingly trying to move to the side. Following the crowd we then went over to a private party organised by a friend which was much more peaceful and there I got a chance to sit and have a relaxed conversation with my friend and her family and also made new friends! It was 1:30 am and I had to finally wrench myself out of the party- couldn’t wait up long as my baby sitter needed to head back home too. The final walk out of LKF was as smooth as before but with most of the crowd leaving at the same time, there was a high demand for taxis. After a wait of over 45 minutes we finally managed to grab one but I was surprised when he charged a premium to drop us! Anyway it was New Year after all and so after thanking the cab driver as we quickly headed back to our building my husband murmured “Nice idea Mehroo, I am glad we went out.” Well that quiet acknowledgement summed up my New Year’s eve for me! HAPPY NEW YEAR! MAY THE NEW YEAR BRING LOTS OF GOOD CHEER, JOY, SUCCESS AND GOOD HEALTH TO YOU AND YOUR FAMILY. Love the new look! 🙂 Happy New Year to you and your family! A nice posting to read. Wish you Happy and Prosperous New Year.2013. Thanks Karuna glad you liked it! Wish you and your family a very Happy New Year too! Thank you for visiting my blog and giving your comment.glad to know that you liked it. I will surely visit your blog too. Best wishes for the New Year. Hey Mehroo! I read this while on holiday in India so couldnt comment earlier. I really enjoyed reading this, what a fun way to begin the new year! Also, love the new look of the blog and your new pics….u look so beautiful in this saree pic! wah wah wah! Thanks for liking this post, one of my on-the-spot, same day ones so quite spontaneous. Thank you again for liking the blog design, was a pain getting it done though, I would anyday prefer writing a post! Hey Mehroo, I read this while on holiday in India so couldnt comment earlier. I really enjoyed reading this, what a fun way to begin the new year! also love the new look of your blog and my God, look at your beautiful pic in this saree…wah wah wah!